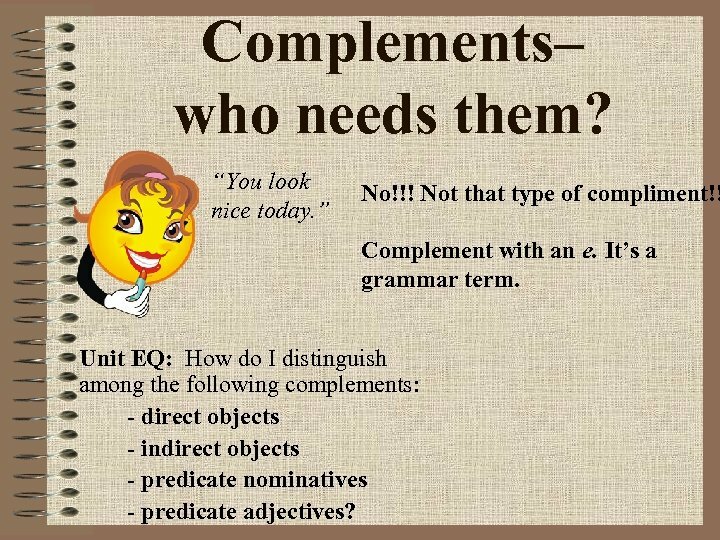 Complements– who needs them? “You look nice today. ” No!!! Not that type of compliment!! 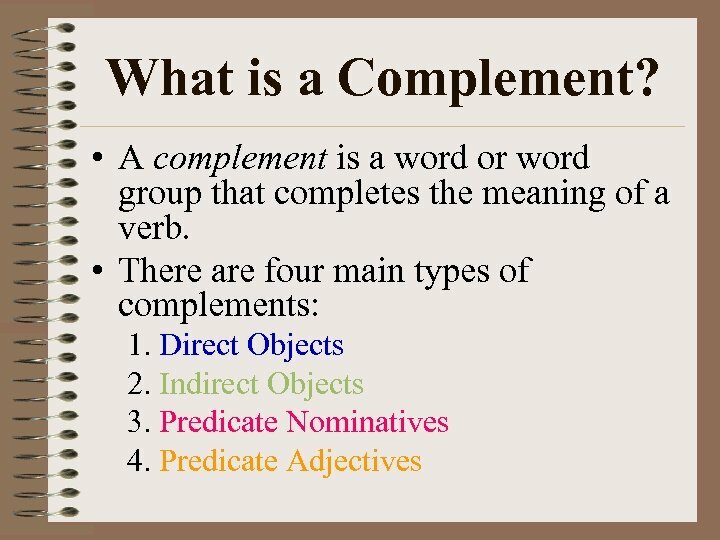 Complement with an e. It’s a grammar term. Unit EQ: How do I distinguish among the following complements: - direct objects - indirect objects - predicate nominatives - predicate adjectives? 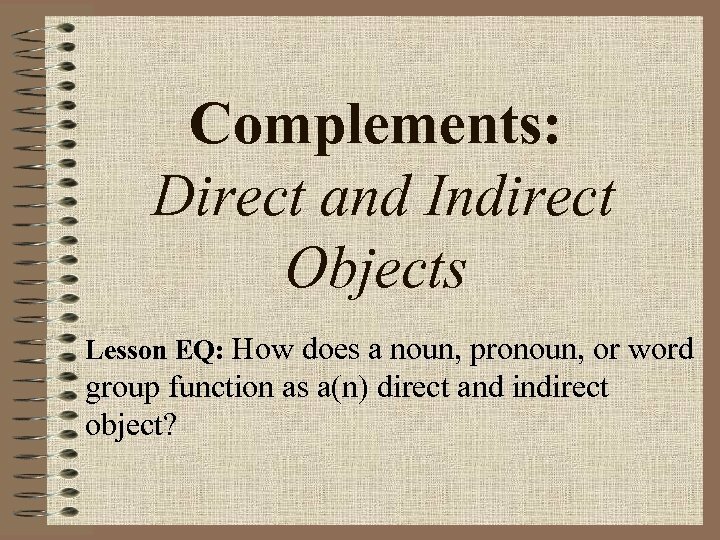 Complements: Direct and Indirect Objects Lesson EQ: How does a noun, pronoun, or word group function as a(n) direct and indirect object? 1. 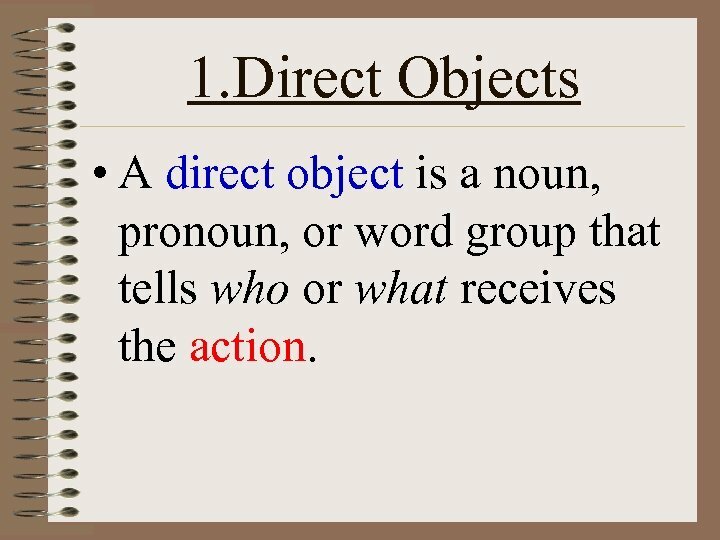 Direct Objects • A direct object is a noun, pronoun, or word group that tells who or what receives the action. 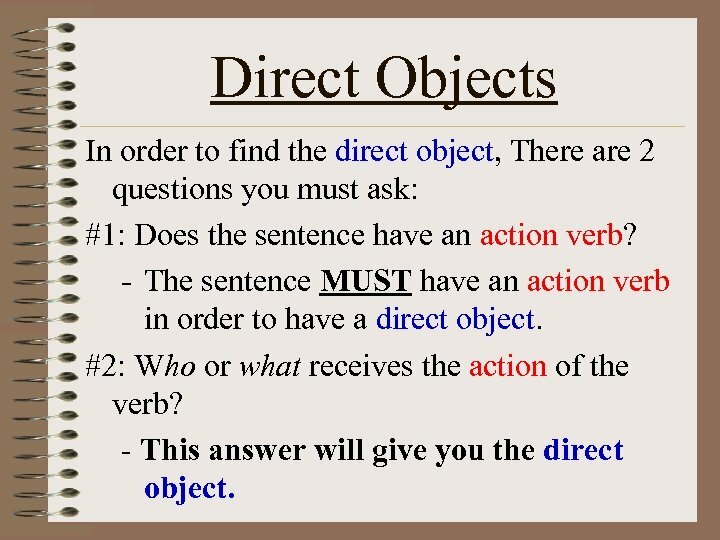 Direct Objects In order to find the direct object, There are 2 questions you must ask: #1: Does the sentence have an action verb? 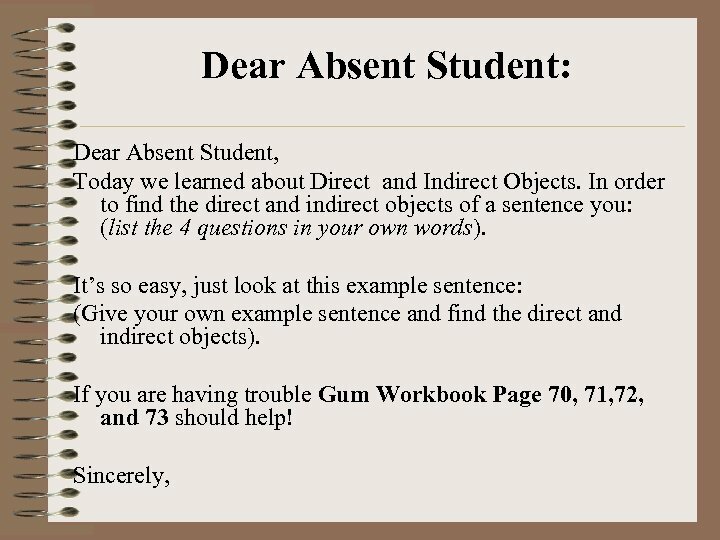 - The sentence MUST have an action verb in order to have a direct object. #2: Who or what receives the action of the verb? - This answer will give you the direct object. Direct Objects Example: Mrs. Mains dunked the basketball. 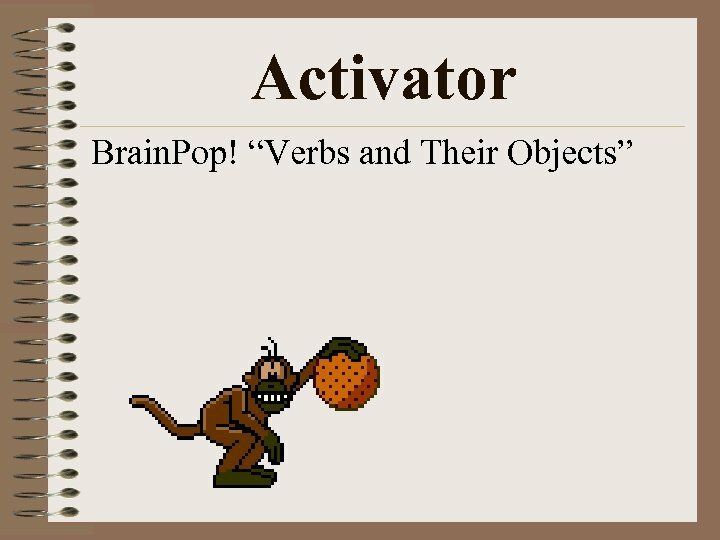 #1: What is the action verb? The word “dunked” is the action verb. 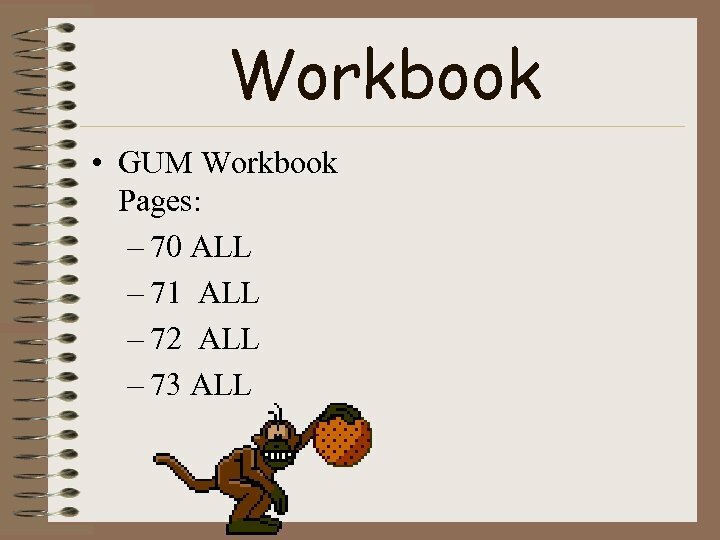 #2: Who or what is being “dunked”? The basketball is being dunked. Therefore, “basketball” is the direct object. Mrs. Mains dunked the basketball. 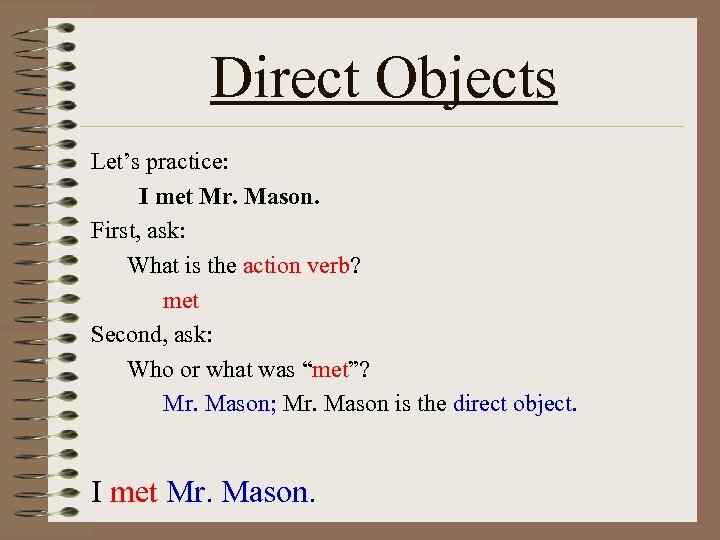 Direct Objects Let’s practice: I met Mr. Mason. First, ask: What is the action verb? met Second, ask: Who or what was “met”? Mr. Mason; Mr. Mason is the direct object. I met Mr. Mason. 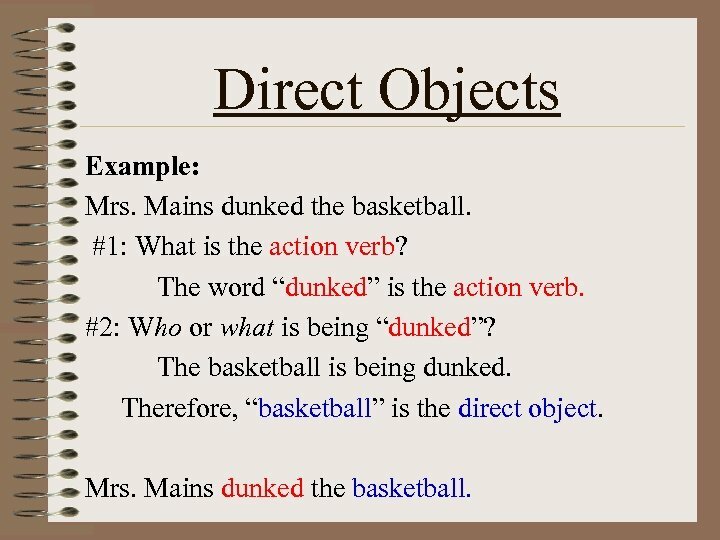 Direct Objects Notice: A direct object is NEVER in a preposition phrase. 1. She worked with clay. 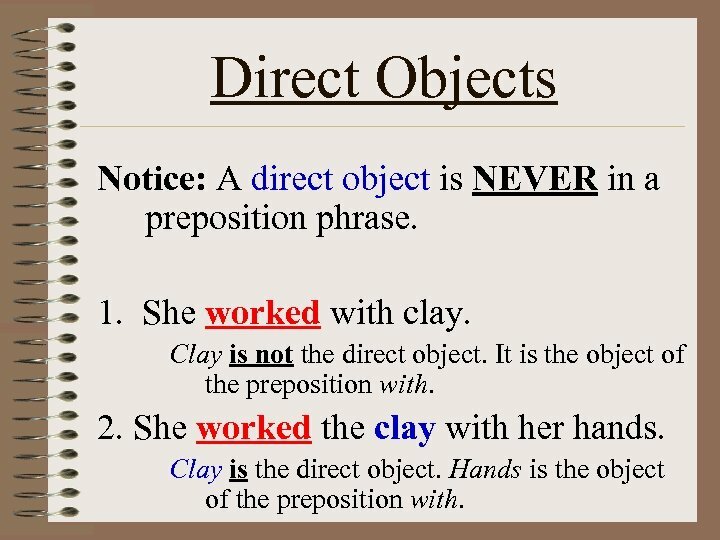 Clay is not the direct object. It is the object of the preposition with. 2. She worked the clay with her hands. Clay is the direct object. Hands is the object of the preposition with. 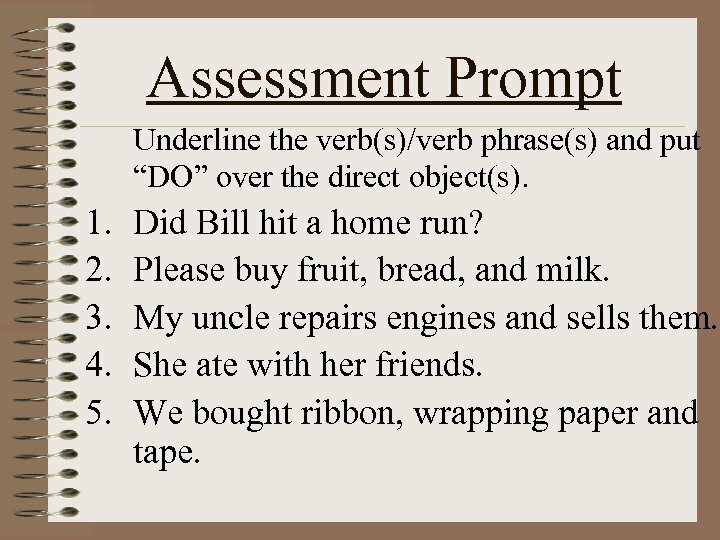 Assessment Prompt Underline the verb(s)/verb phrase(s) and put “DO” over the direct object(s). 1. 2. 3. 4. 5. Did Bill hit a home run? Please buy fruit, bread, and milk. My uncle repairs engines and sells them. She ate with her friends. We bought ribbon, wrapping paper and tape. Direct Objects 1. 2. 3. 4. 5. Underline the verb(s)/verb phrase(s) and put “DO” over the direct object(s). Did Bill hit a home run? Please buy fruit, bread, and milk. My uncle repairs engines and sells them. She ate with her friends. We bought ribbon, wrapping paper, and tape. 2. 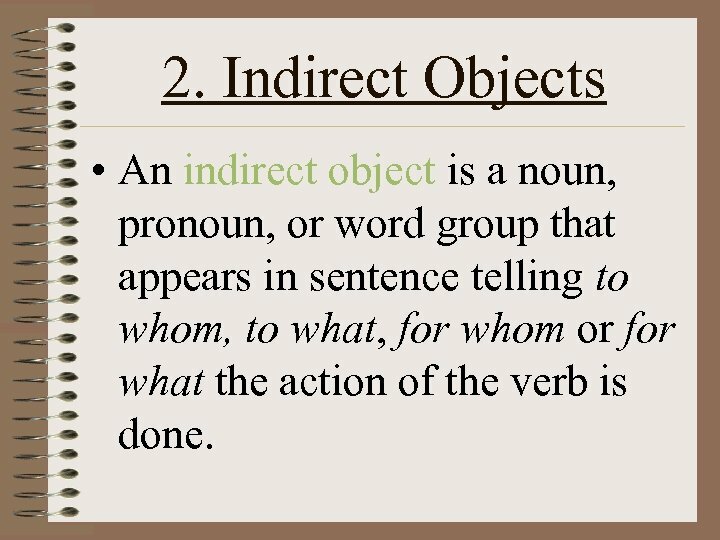 Indirect Objects • An indirect object is a noun, pronoun, or word group that appears in sentence telling to whom, to what, for whom or for what the action of the verb is done. 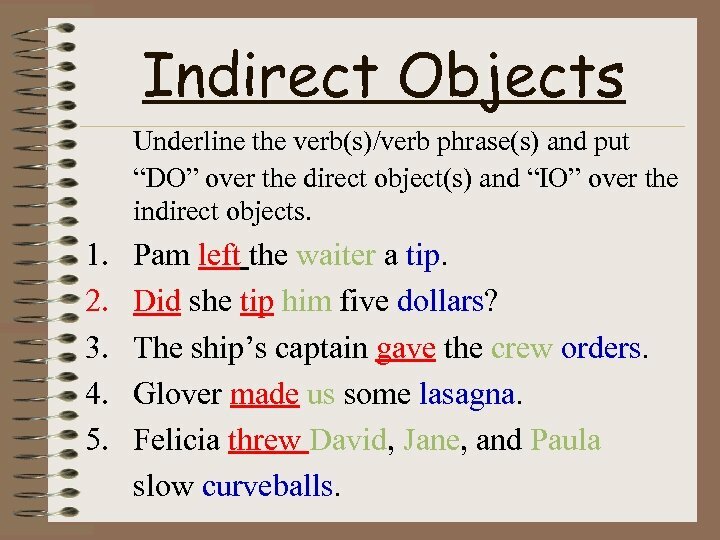 Indirect Objects In order to find the indirect object, There are 2 questions you must ask: #1: Does the sentence have a direct object? 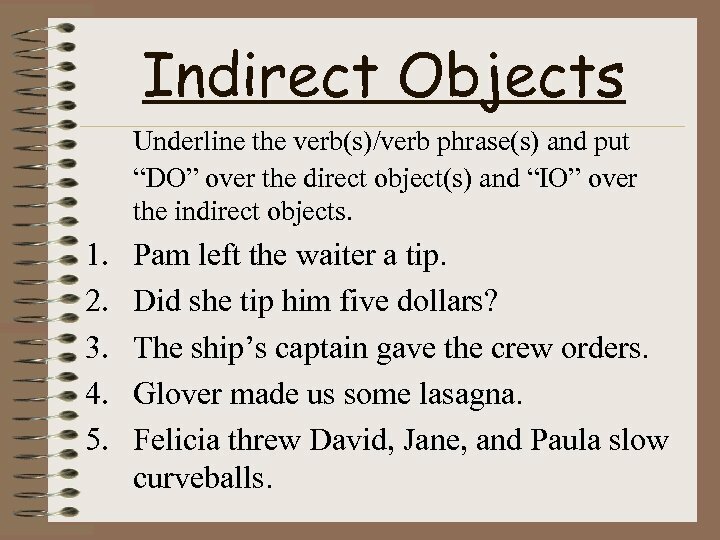 - The sentence MUST have a direct object in order to have an indirect object. #2: To whom, to what, for whom, or for what was the action done? - This answer will give you the indirect object. 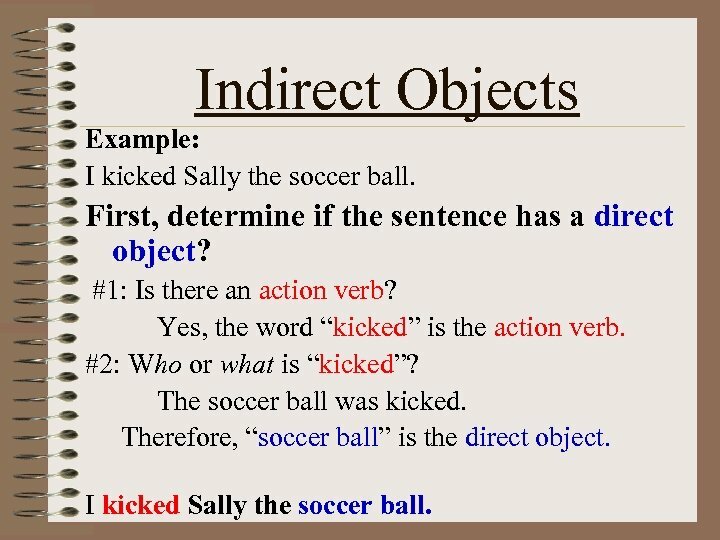 Indirect Objects Example: I kicked Sally the soccer ball. First, determine if the sentence has a direct object? #1: Is there an action verb? Yes, the word “kicked” is the action verb. #2: Who or what is “kicked”? The soccer ball was kicked. Therefore, “soccer ball” is the direct object. I kicked Sally the soccer ball. 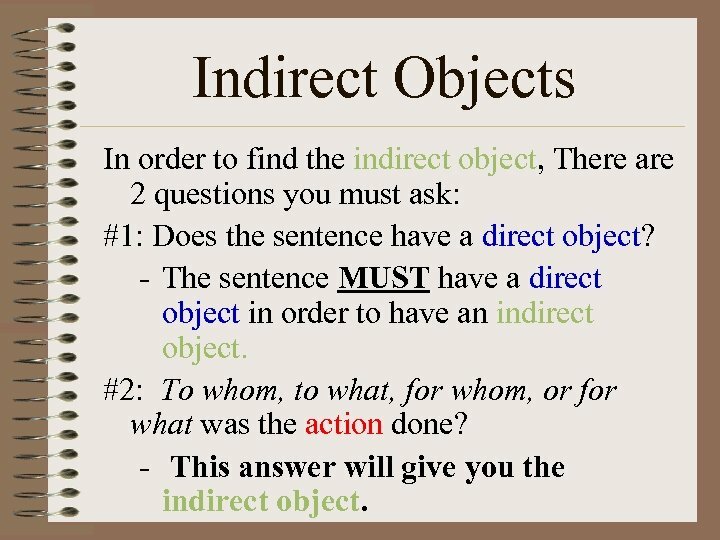 Indirect Objects If there is a direct object then ask To whom, to what, for whom, or for what was the action done? I kicked Sally the soccer ball. #3: To whom was the soccer ball kicked? The soccer ball was kicked to Sally. 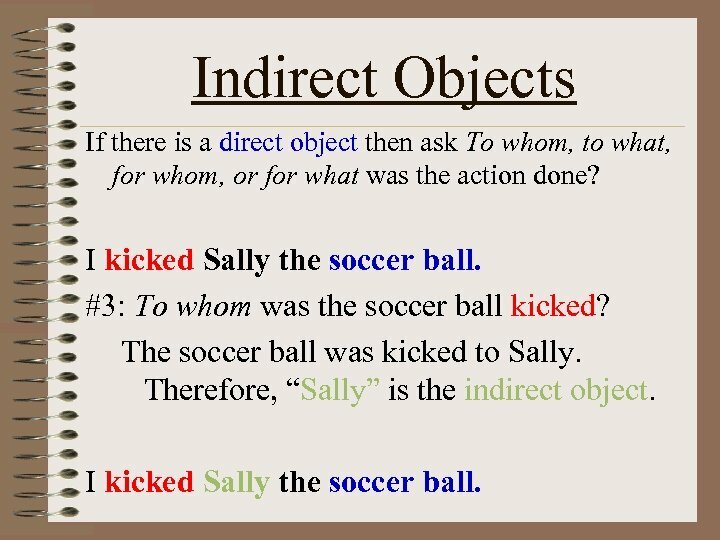 Therefore, “Sally” is the indirect object. I kicked Sally the soccer ball. 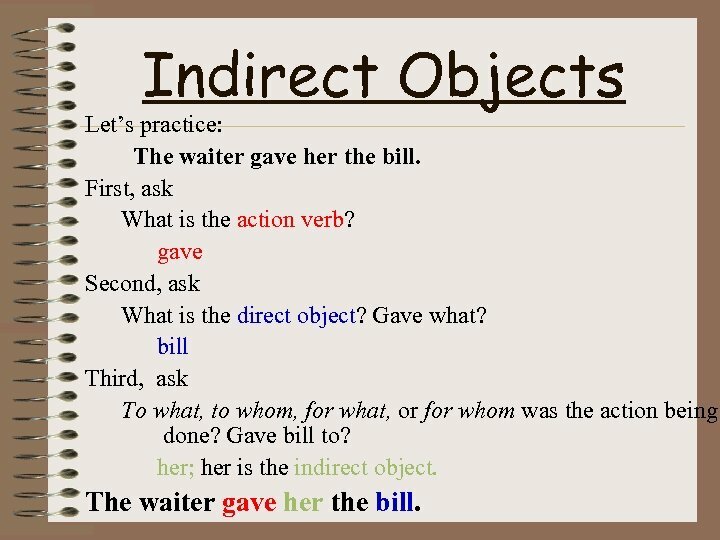 Indirect Objects Let’s practice: The waiter gave her the bill. First, ask What is the action verb? gave Second, ask What is the direct object? Gave what? bill Third, ask To what, to whom, for what, or for whom was the action being done? Gave bill to? her; her is the indirect object. The waiter gave her the bill. 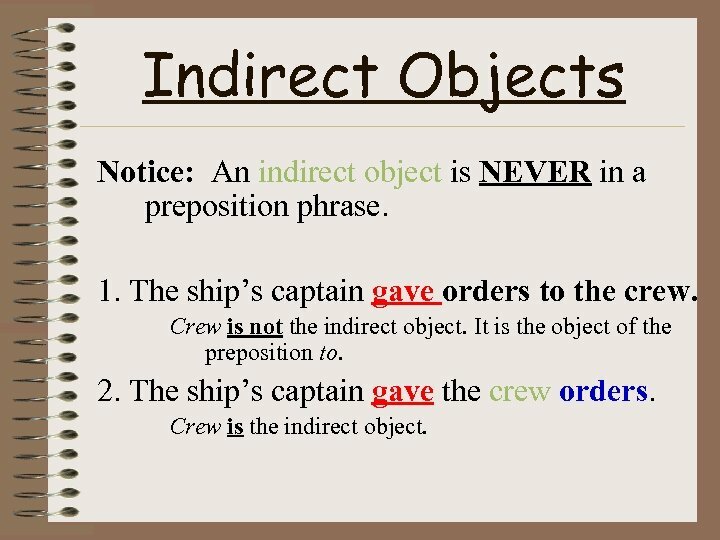 Indirect Objects Notice: An indirect object is NEVER in a preposition phrase. 1. The ship’s captain gave orders to the crew. Crew is not the indirect object. It is the object of the preposition to. 2. The ship’s captain gave the crew orders. Crew is the indirect object. 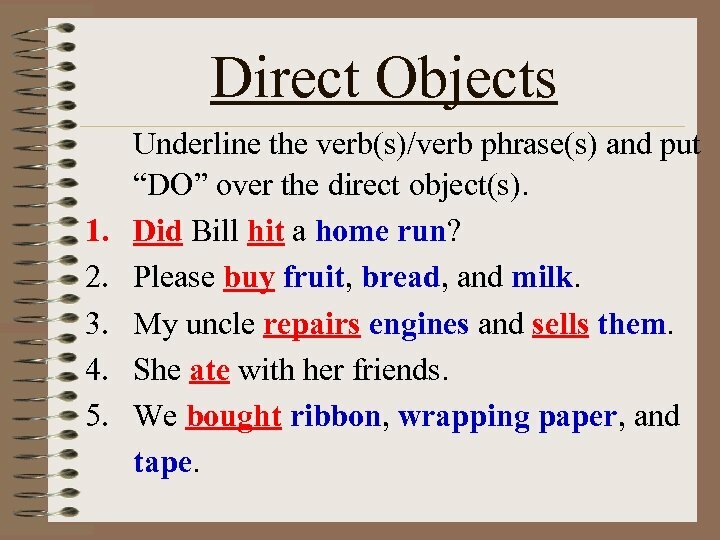 Indirect Objects Underline the verb(s)/verb phrase(s) and put “DO” over the direct object(s) and “IO” over the indirect objects. 1. 2. 3. 4. 5. Pam left the waiter a tip. Did she tip him five dollars? The ship’s captain gave the crew orders. Glover made us some lasagna. Felicia threw David, Jane, and Paula slow curveballs.